BLOOMFIELD HILLS, Mich. , February 12, 2019	(PressRelease.com) - Originally developed for a major automotive manufacturer for use in robotic assembly cells, the molded high-density plastic surround cover design enables impact stamping units to significantly reduce resonance decibels, in some cases, as low as 67 db. Columbia Marking Tools, Inc. pioneered the development of the double-acting air-operated impact marker and for many years the patented 8-ton Model 751 and high-powered 12-ton Model 851 Slide-A-Mark units have been the preferred choice for applying impact marks into a wide variety of materials. This includes such things as date stamp & shift codes, QC marks, part numbers, traceability marks, company logos, lot numbers, trademarks and even some staking operations. Over the years, Columbia’s impact markers have continued to evolve with improved types of alloys, steels, including high-strength low-alloy steel (HSLA) and different formulations of casting materials to provide more versatility in the range of marking pressure capability. As the industry continues to look for methods to reduce decibel resonance on manufacturing processes, Columbia Marking Tools has recently introduced their S.A.S. system. 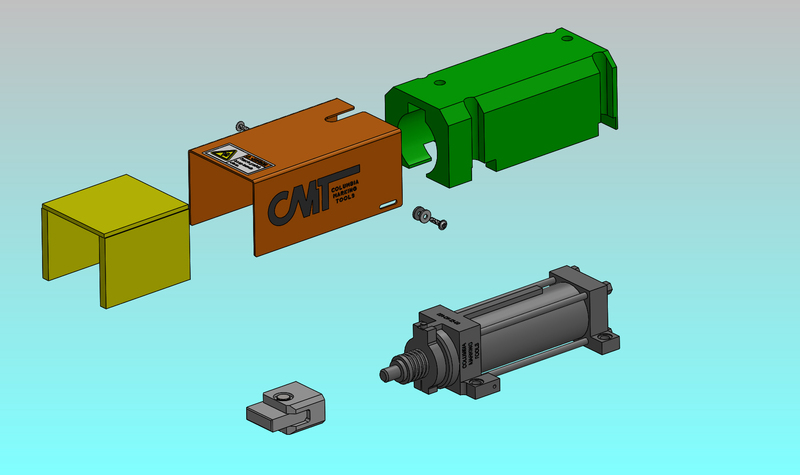 The sound abatement design includes a lightweight high-density, flame-retardant, plastic sound absorbing cover for the cylinder assembly and an “add on” optional sound absorbing ram sleeve designed to accommodate various part stamp tooling lengths depending on the application. The S.A.S. system can be purchased as a retro-fit package or with the purchase of a new Model 751/851 marker. Retrofitting takes just minutes to install. The S.A.S. system can be purchased as a complete stamping unit with a machine frame and an optional sound absorbing high-mass adjustable telescoping pedestal base for robot cell application. Robot manufacturers can specify a junction box with terminal strip pre-wired to part and motion sensors and actuation air valve to make a faster and cleaner installation. 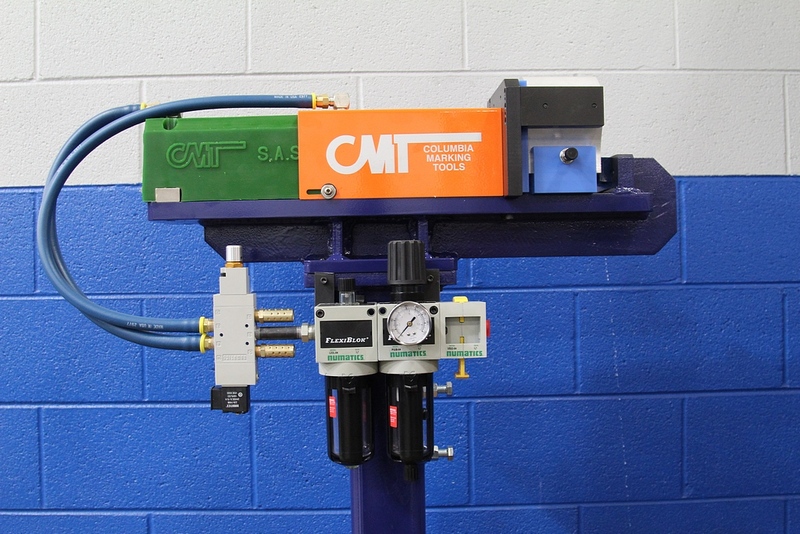 Columbia Marking Tools can also provide a manual load/unload station. The Model 751/851 is designed with a cylinder body and bolt-mounting pattern to enhance interchangeability. A variety of different keyed air-powered rod and stamp holder styles are available. The Model 751/851 can produce a force range of 1/4 to 8 tons. In operation, the marker utilizes a two-stage impact marking sequence where the marker telescopes out to pre-load the stamp or staking tool against the work piece and then the cylinder fires an internal hammer generating a consistent impact force which is varied by controlling the actuation air pressure. Fixed internal air passages control the marker’s speed. (Typically, a 2-1/2-inch unit cycle is less than one second). The Model 75/851 is also offered with optional retracted or dual position sensors for return and advanced position of the cylinder stroke to augment their application with automation. By simply loosening a mini dovetail clamp, the advance position sensor can be adjusted to one inch. Strokes can range from 2-1/2 to 12-inches while the marking pressure remains the same anywhere within the stroke. Slide-A-Marks are powered by factory air and controlled by a standard 4-way air valve with a regulator to vary the marking force. It is recommended the mail shop supply to be a ½-inch air line with a maximum pressure of 100 psi. Columbia Marking Tools is a leading designer and manufacturer of metal and plastic marking equipment including stamps, roll marking dies, roll marking and impact marking machines, fully programmable pulsed fiber diode laser, peen/scribe marking and UID/2D square dot machines, numbering heads and special marking machines. 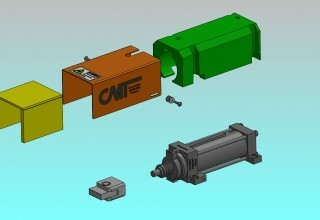 system assembly that can reduce average decibels to 67 db. Hall Industrial Publicity, Inc. Columbia Marking Tools, Inc. Flexible, multi-sensor probe system for tactile scanning, non-contact inspection and surface finish measurement is now available on a 5-axis ceramic-bridge CMM that is providing high-quality performance across all manufacturing environments.